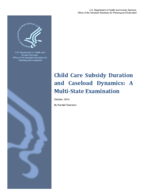 The scholarly field of early childhood development has yet to fully embrace a specific methodology for measuring child care subsidy duration and this section is intended to provide a series of medians to compare and contrast various approaches. The details of the methodologies are summarized in Table 5. The methodologies vary by whether they require one or two months to precede and follow a spell of receipt, and they differ by whether they include or exclude families with recent spells of previous program usage. Table 6 presents median spell durations using the five methodologies described above for families beginning new spells of participation in Fiscal Year 2007. In the aggregate, the medians from the combined 35 states did not show large amounts of variation across the methodologies. For example, the median spell lengths did not change when the populations were restricted to families that were either receiving subsidies for the first time or were returning to the caseloads after a three-year exit from the programs. Requiring two months of non-receipt to precede and follow a spell of participation increased the median spell durations from six to seven months. Variations in the medians across methodologies are more pronounced for some states than other states. For example, the median spell lengths for new and returning families (one month methodology) were the same in 22 out of the 35 states and were within one month of each other for 11 of the states. However, the medians for the families without recent participation in the states of Vermont and Alabama were two months higher than the medians for the families that were returning from recent spells. Changing the minimum participation gap from one to two months of non-receipt before and after a spell altered the median spell lengths for all but six of the states (new entrants only). In the remaining states, 23 of the medians were one month higher, five of the medians were two months higher, and the medium in one state (Alabama) was three months higher when the two months gap approach was used instead of the one month gap. Care should be used when making comparisons across the states because it is not clear whether the differences were influenced by variances in reporting across the states. For example, states may differ to the extent to which they retrospectively correct or update their data systems when payment amounts are altered when appeals or recalculations are made.